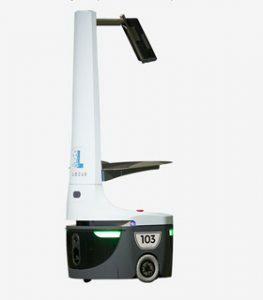 Locus Robotics (www.locusrobotics.com) demonstrates its award-winning E-commerce warehouse robots at the National Retail Federation’s annual convention, held from January 14-16 at the Jacob K. Javits Convention Center in New York City (USA). The Locus booth will simulate a real warehouse environment, featuring a live demonstration showcasing how Locus’s autonomous mobile robots work safely alongside workers in a space that is often highly congested and dynamic. Visitors entering the ‘warehouse’ will have the opportunity to interact directly with the robots to experience their unique collaborative qualities and efficiency benefits first-hand. Locus’s turnkey warehouse fulfillment solution enables retailers and 3PL providers to achieve more efficient e-commerce fulfillment operations, while simultaneously lowering labor costs and effectively managing seasonally fluctuating order volumes. Locus customers, which include DHL Supply Chain and Quiet Logistics, the 3PL that ships over $1 billion e-commerce orders a year for retailers including Zara, Bonobos, Glossier, and more, are already seeing doubling or tripling of fulfillment speed with near-100% accuracy, while saving 30% or more in operating expenses.